What can one say against a blue shirt? It’s a classic and comes in many forms and colours; either completely blue or striped, which are the most popular and commonly known colour forms. But when you think of different forms you might only get the idea of a classic button down, so what could possibly be meant with a blouse having all sorts of different forms? 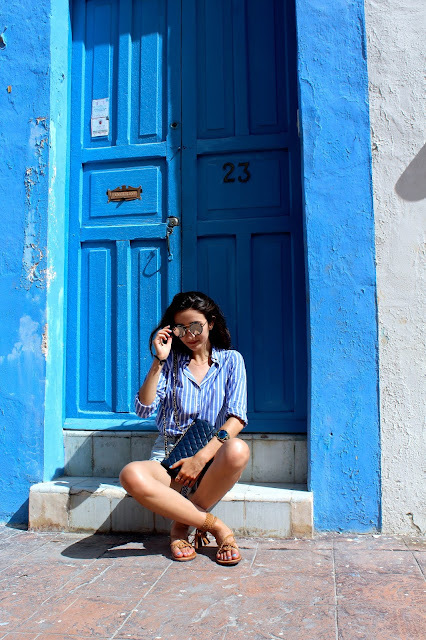 The attentive fashion girls amongst you might know that since last year the all time classic has been reinvented, remember how I showed you different ways of how to use a simple with shirt last year? Well this year the focus lays on blue toned blouses, you might come across blouses with enormous sleeves (this trend will definitely keep on this year! ), blouses with short sleeves, knotted blouses and blouses without a neckline. There are also shirts that look like the are tucked around your shoulders, this creates a whole new way of the off-the-shoulder blouse. What also will remain for us to use in 2017 are cheeky messages and logos on your shirts ( which I will tell you more about in a future post! ). No matter what type of shirt you prefer, expect to have a huuuge range of options (which you can also find on sale now!!!!) of blue button downs to choose from.